Ooh these look really good! I love everything in this one! I have bananas in the freezer!! Yahoo! I can't wait to try these! Oh yowza and I have three bananas on the counter, just about ready for a monkeyin' around little nibble. Delicious! This is my kind of treat - I love every ingredient. I am glad that the other department enjoyed your treats and showed you some appreciation - you deserve it. All I can say is yumm!! I'll be trying these! Sounds like an inspired idea! They looks great! Your co-workers would be crazy not to love them! I would love to see an inter-office war break out - all wanting your delicious treats! 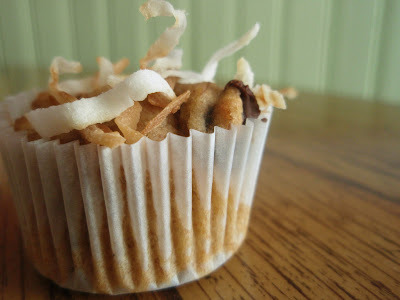 I've been craving bananas lately (let's hope I'm not pg again)-and this recipe sounds delish. Never knew that rabbits like bananas.ha! Hey these are awesome, all the flavors I adore! You made my morning! So, you made me laugh, once again! Of course, some of my kids have an irrational dislike for monkeys, so I guess this would have to be "bunny bread" for them! Sounds delish! I guess I didn't read the post about ungrateful recipients of baked goods. How rude! Anyway, I'm sure that these were appreciated, because they look damn good to me! They have peanut butter banana bread? You're holding out on me, girl!!! Bake that! Those these monkey bites do look "wild!" with my fondness for monkey bread, you KNOW i'll be making these right away! dutifully bookmarked in delicious. Ohh the things that keep us up at night. But these look amazing. How can that combination of ingredients go wrong. I luv peanut butter & chocolate and your kitchen project was a fun read. 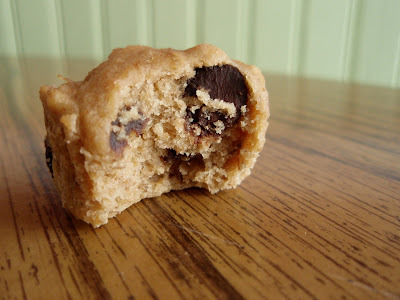 Next time, why not just fill the center with chocolate and peanut butter...a kinda surprise? What fun! I'd enjoy these even if you called them the monkey's bunnies. I like that the texture is different from your average muffin. Peanut butter, chocolate, cinnamon, and bananas ... life is good! Hey, seriously, if your co-workers are snubbing treats you can always send them my way. These look fantastic. I think having these little beauties on my counter is what would keep me up at night! Now I want to go to Cold Stone and try that ice cream. Maybe you can pitch the idea to them and have chunks of this put into the ice cream...works for me! Grace, these look amazing. Anything with bananas in it I love!! Inter-office battle of the goodies? LOL I love reading your blog. 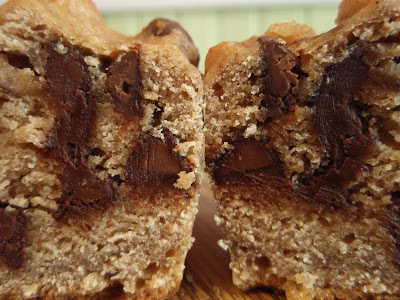 Bananas, peanut butter, chocolate and nuts ... heaven sent muffins! You really know how to get those taste buds a tingling : ) absolutely loving and craving those flavors!!! Please keep us updated if any inter-department wars ensue. I just used up some elderly looking bananas today in banana bread but I wish I saw your recipe first! Wow. You are the queen of muffins. Those look amazing. I wonder why I always seem to forget that most any baked good is better with chocolate! Oh god, I think I'm in love. They got rid of banana ice cream at the Cold Stone here and I'm boycotting. They probably won't notice, but I miss my Monkey Bites! Also, I ordered the Peanut Butter Perfection with Banana Ice Cream instead of chocolate and called it The Elvis. But alas, no more. I might be making these this weekend! mmm i wish i worked in your office! OMG Grace! I want these....I think I need these, seriously!! Oh my my..these look right up my alley! Who cares what it's called it looks yummy! And I so want to see the different departments duke it out for your goodies! I was sceptical at first, but you won me over - this sounds delicious. 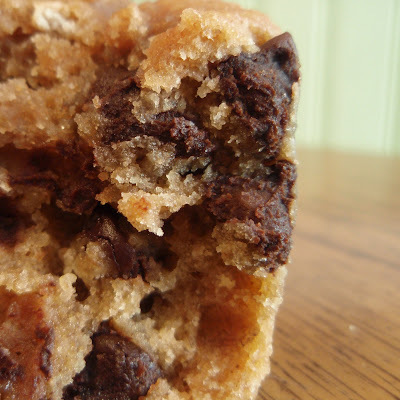 The banana chocolate muffins I make are dense too - hmmm..wonder what the combination is that gives that end result. Re the coworker thing - you bring in alot of goodies - start selling them and inspire your office to make a donation to charity by buying a "whatever". i want to work in your office! these look incredibly delicious. if i worked in your office i would definitely battle over these! peanut butter and banana sandwiches are my fav... why didn't i think to make it into a muffin! geez. i never knew rabbits like bananas. i have a rabbit, so we'll see if she likes 'em! Wow, what a fabulous treat! I am sure my little 'curious george's' would love this! Now at this very moment I wish for a tea party with a monkey and a bunny, and for sure I'd be serving these. These are cute. LOL I like hearing about what goes on at your work regarding the sweets :D. I vote for bunny bites :). YUM! I'll be a monkey if it means I can have some of those muffins! I think those office people are going to start begging you to bring in treats again. I left some treats for my son's teachers the other day and they actually wrote me a thank -you note! How cute, huh? 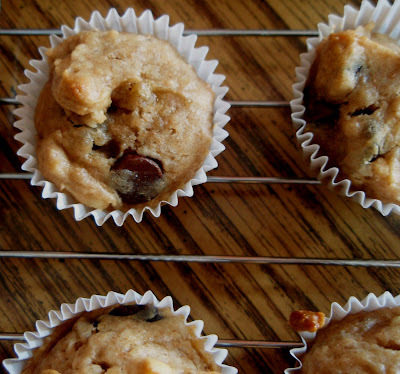 These look like delicious little muffins! I love the idea of an inter-departmental war - it'd be like Star Wars, at work, over DESSERTS - love it. Your creations deserve nothing less. The questions that keep you up at night are not unlike my own. Like, why is my favorite ice cream, Moose Tracks, called "Moose" tracks? What in creation does that ice cream have to do with a Moose? On that note, why don't we call more than one Moose "meese"???? Love the cake list above! I need to go find me a princess torte ASAP! By the way, found a store in Austin called Just Desserts today...if you ever come down I'll take you there! Holy guacamole those look good! I love the addition of coconut on top. As for the sweet 100, I haven't even heard of half of them, much less eaten them!! You are too much, this was hilarious. Glad your office treats are getting the attention they deserve in the other department! They certainly look like the kind of treat that would help my afternoon go smoothly at the office! I think you cold stone creamery inspiration was just plain GENIUS and I may peruse there next time I'm home for some ideas of my own. Thanks for your help with ya'll -I knew if anyone could help a sister out it was you! The sweet 100 looks like a lot of fun. I think the combo of flavor you used sounds really great. Nestle Crunch Bar? WOW! I haven't had one in years. I'd elbow all the monkeys and bunnies of the world aside to get at these babies. Dude, they look like banana bread and chocolate chip cookies had sweet, sweet babies. Babies I wanna eat. Ahah!! I was just wondering what to do with the bananas wasting away on the counter! Thanks for this brilliant concoction! A great way to use up my bananas! Grace, they look absolutely fantastic! I'm sure they tasted great as well! Guess people feel more at ease with stereotypes (it simplifies their already complicated life) and that's how bananas are now associated with monkeys (spiders will have to wait). Love your inter-departamental startegy ;) and I would change departments for your muffins! If only muffins are made how many would the recipe, as presented, make?